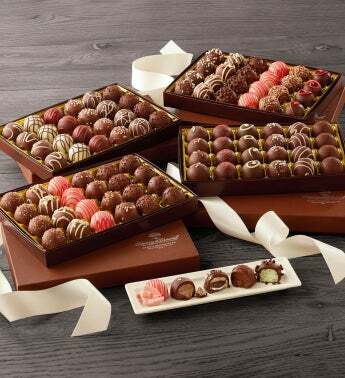 Stock up on gourmet truffle gifts with the Ultimate Truffle Collection, which includes four individually gift-boxed one-pound collections of chocolate truffles: signature truffles, dark chocolate truffles, dessert truffles, and ice cream parlor truffles. Each beautifully boxed collection comes with a flavor map. The truffles are made here in our candy kitchen from our secret recipe and decorated by hand.